Source: CICH graphic created using data adapted from the Survey of Young Canadians 2010/2011, Statistics Canada and National Longitudinal Survey of Children and Youth 2002/2003, Statistics Canada- custom runs. 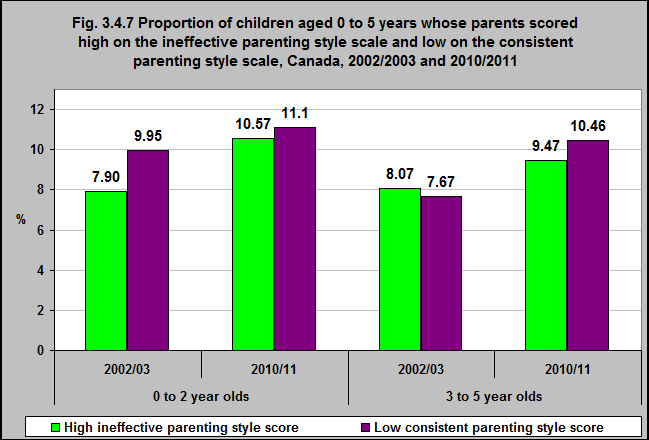 Between 2002/03 and 2010/11, the proportion of children age 0 to 2 and 3 to 5 years whose parents scored low on the consistent parenting* style scale increased. In that same time period the proportion of children aged 0 to 2 and 3 to 5 whose parents scored high on the ineffective parenting** style scale also increased. *The National Longitudinal Survey of Children and Youth (NLSCY) and Survey of Young Children (SYC) measure consistent parenting by looking at parental behaviours such as setting clear and consistent expectations, and using non-punitive consequences with regard to their child’s behaviour. **The National Longitudinal Survey of Children and Youth (NLSCY) and Survey of Young Children (SYC) measure effective parenting by looking at how parents communicate with and discipline their children.